Last week, we caught up with 10 String Symphony – the Nashville duo of five-string fiddlers that was one of our favorites at CMJ last fall. 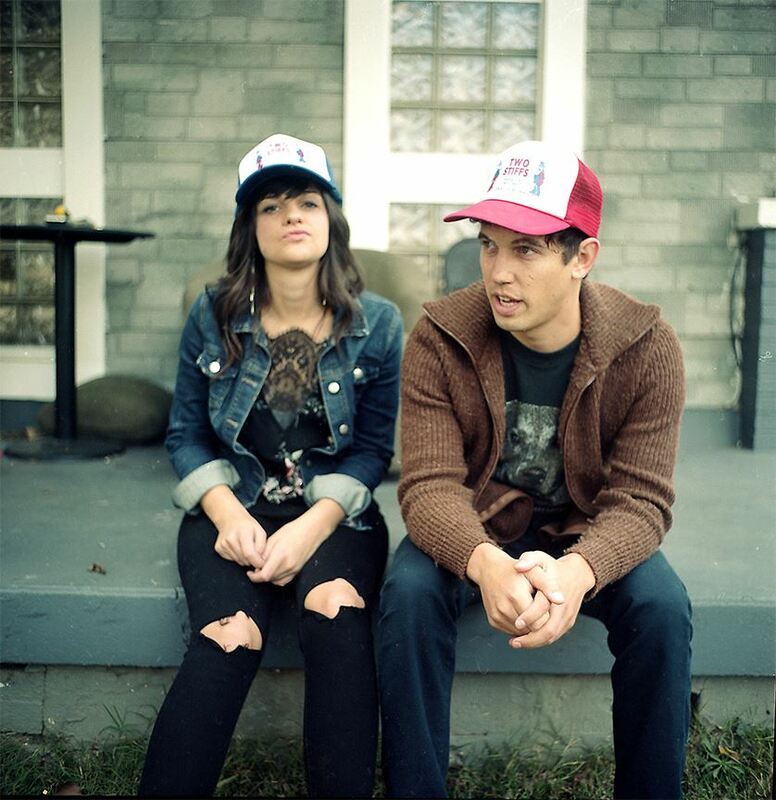 Christian Sedelmyer and Rachel Baiman started busking together in Nashville two-and-a-half years ago, put out an album shortly thereafter and have since toured the nation together. The band is currently in the midst of a two week recording session for their sophomore and self-described “coming of age” album, so we bothered them in between sessions to dig into that one a bit. It’s been a little over two years since you released your debut. What have the last couple years been like? Rachel: When we created our first record, we were both heavily involved with other musical projects, and while we will always work independently, this new record is born of a mutual decision to really make a go of 10 String Symphony and prioritize it heavily in our careers. The past two years have really been about becoming a band. We’ve toured quite a bit, both in the US and abroad and have worked really hard on our live show. As a duo, it’s a bit harder to create a really compelling live performance that feels energetic and full at all times. We’ve grown a lot in that regard and as a result have started playing some bigger stages such as the Strawberry Music Festival. We’ve had some incredible times–a five week tour in New Zealand, and numerous tours on the West Coast. Throughout that time, we were both kind of experimenting with how much of a role we wanted this band to have in our careers and gradually we both decided that it felt good and that we really wanted to commit to it on a larger scale. Christian: Arranging has always been a primary focus of this band – the two 5-string fiddle thing can sometimes get in the way if not aligned thoughtfully – but the material for this new record really emphasizes a newer focus on songwriting. We’re really excited to see how it will all turn out – so far, pretty pumped. You entered the studio again last week to record your sophomore album. What can fans expect from this one? How’s it different than your debut? Rachel: This new record is sort of a “coming of age” for us. We’ve found a really unique sound, and have had time to explore so many different arrangements. We are much more relaxed and confident as people, and I think that will come across. This record will also be largely original material, while the last was more based on traditional folk songs. As a result, I think listeners will find it more personal, more revealing, and more vulnerable. Christian: I definitely think we understand how to meld together more instinctively this time around. The content of the songs is a little more timely and relevant to our lives the past couple years as well. It almost feels like the process of recording our first record was learning how to become a band, and this one is more of a concentration of how we create together now – having played that many more gigs, listened to that much more music together, and drunk that many more hundreds of coffees. Are you writing together or independently? What’s your creative process like? Rachel: We create the arrangements together…it’s a painstaking and excruciating process. Some of our roommates, who have been victims of such rehearsals would attest to that. One thing that we’ve realized, with such exposed instrumentation, is that usually a song sounds absolutely terrible up until the point where it sounds amazing. There is really no middle ground. Christian: Rachel wrote most of the lyrical content for this album – and it’s awesome. She’s taking writing very personally now – not just as a reflection of what’s going on in her life, but in analyzing why she likes the songs she likes; and she’s really quick at it. I co-wrote one of the songs with Josh Britt, the mandolin player and one of the songwriters in The Farewell Drifters, the band I used to play with. That was a great experience – I had an idea and a feeling I wanted to create, and working with him to capture what it is I was really trying to say in an accessible way was a great learning process. Some sort of hybrid of emotion and rational thought. Rachel and I have always arranged everything together, and I think our arrangement sensibilities have aligned to a place where even though it can take us a while to arrive at a final arrangement we’re happy with, the depth of those arrangements seem much stronger now. Has there been any notable inspiration source for this album? Rachel: So many! But it’s not a concept album or anything, so it would be hard to answer that question really. I will say that we’ve been listening to a lot of Blake Mills and LAU. Christian: I’ve found a lot of inspiration in my life experiences over the past couple years – traveling a lot, meeting lots of new people, and hearing lots of different, interesting music. We’ve both dealt with some difficult times, and I think our shared love of making music together has shined through and is sort of subtly pushing this album past our expectations. Who are you working with on this one? Christian: Our good friend Mark Sloan is producing. He has a bit of a genius musical mind – very well informed, but doesn’t let it get in the way. I think that quality is also a big part of the music I’ve been listening to lately – I love the new Blake Mills record, I think he’s a ridiculous player. You’re fundraising for this one on Indiegogo (one week to go). How’d you decide to go that route? Rachel: In this day and age, it’s hard for me to imagine how bands get off the ground without crowd funding. Even if you work with a record label, the new model is, record the album, THEN present it to a label. Working independently, you maintain complete creative control, and avoid the risk of being locked into a record deal that doesn’t benefit the band financially. On the other hand, we really wanted to invest in this project, make it as good as we possibly can, and we knew we would need some serious money to do that. Crowdfunding is a great model because you not only raise the money, you develop close and personal relationships with your fans, and you also promote the new project. It is hard to ask for money, but I really feel that if it’s done in the right way, it should be about people contributing because they want your music to happen, and they want a copy of the record, not because they feel sorry for you. Rachel: Yes. Home roasted coffee by Christian. If you enjoy good coffee, you will LOVE Christian’s home roasts. He can tell you more than you’d ever want to know about coffee! Looks like you’re hitting the road after recording? Rachel: Yep! We have a great West Coast tour lined up in February, then Folk Alliance and some East Coast dates in March and April. We recently started working with a great booking agency called Prater Day, and it’s looking to be a big year for us!